Over the past few weeks we've started working with denim. We've found a couple colors that look great as portfolio books. These denim portfolios are now available for sale in our showroom and on our online store. They can be found here and start at only $174. We can personalize these with a custom font or logo. Contact our sales team to learn more about what we can do with denim! We are very happy to announce that we are now hand-making goods out of Horween Leather. We have made a couple samples out of the 8/9oz Chromexcel and will continue to explore the collection in the near future. 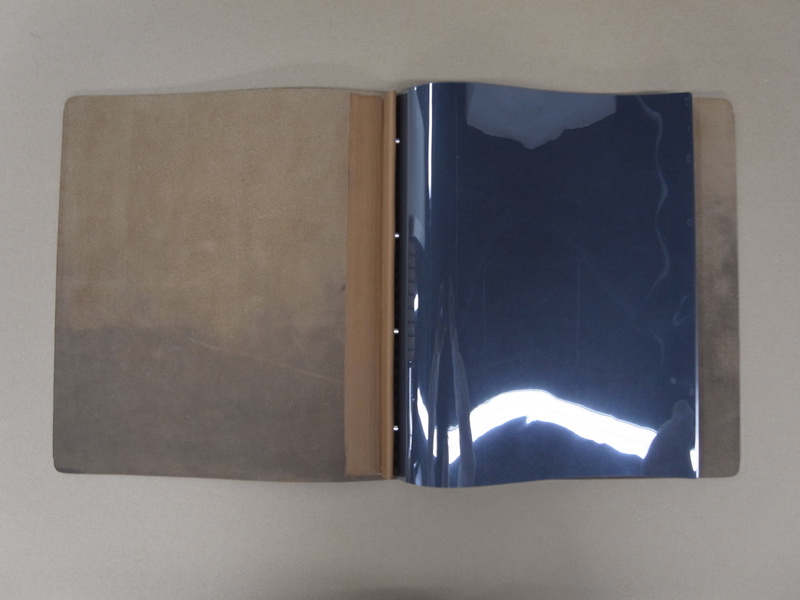 Here are some sample images of a portfolio book made with no lining and natural naked tan leather binding. 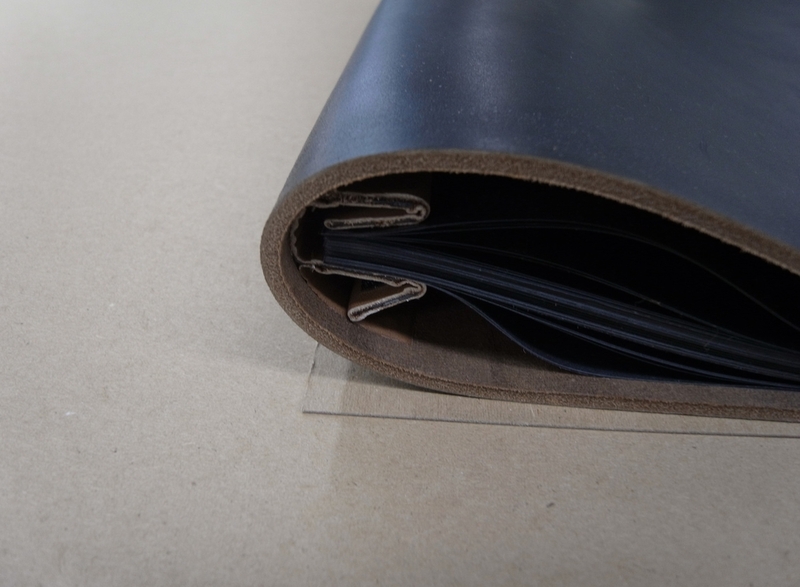 The thickness of this leather allows for a beautiful deboss. The above stamp is a dull brown on the inside of the raw Horween Leather. We're very excited about the possibilities available to us with this new addition to our leather collection! This month we were featured as the business of the month by the Made In NYC organization, which operates out of Pratt University. Check out the write-up here. This book and bag combination was ordered by our friend Bret Hartman, who is based out in Los Angeles, CA. This is a great example of what bold text and thick lines looks like on genuine leather. This leather is finished and reacts very well with a deep stamp. The book and bag look great together. The artwork carries over very well. Mr Hartman took advantage of an ongoing promotion that gives a free stamp on a bag if purchased together with a portfolio that is being stamped. If you send us a logo as an illustrator file with outlines we can make a die and stamp nearly anything with it. The label on the bag is made of SK, a limited edition proprietary material that stamps very well. We have a small run of express books available on our online store. Bret Hartman can be found at brethartman.com or at (213) 422-4303. 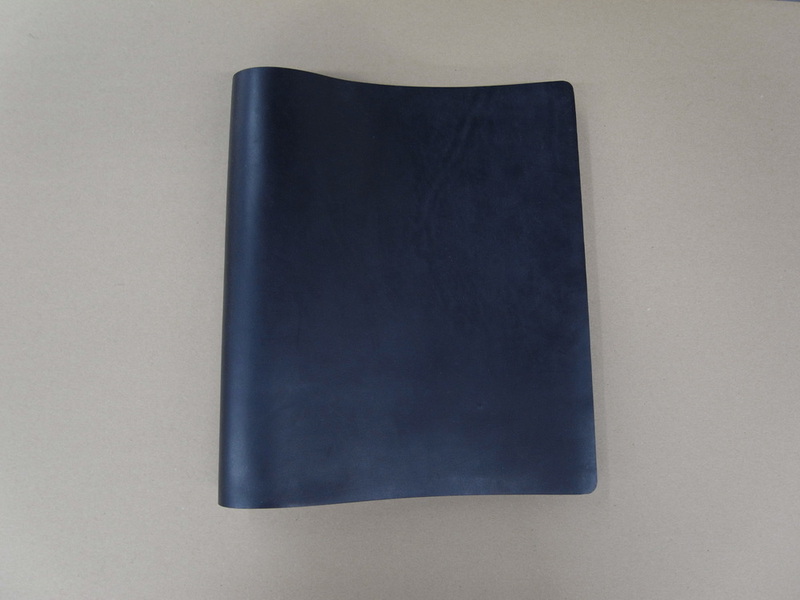 Our National Edition Bindery Division can bind various editions of comic books into beautiful leather bound books for collectors all over the world. We have done work for DC Comics as well as many private collectors who wanted to create a custom archive of their own collection. Create your own customized book with any personal artwork you'd like debossed on the cover, spine, back cover, or insides.